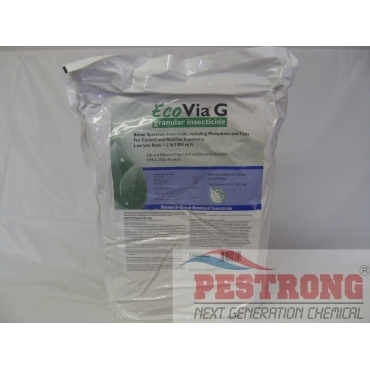 Where to Buy EcoVia G, EcoVia G Granular Botanical Insecticide - 10 Lb - $50.55 for Sale with Fast Free Shipping! EcoVia G Granular Botanical Insecticide - 10 Lb is broad spectrum Insecticide for control and residual repellency pests including mosquitoes and ticks. KILLS: Ants, centipedes, chiggers, chinch bugs, cockroaches, crickets, earwigs, fleas, leafhoppers, mosquitoes, millipedes, mites, sowbugs/pillbugs, ticks and other insect pests in turf and landscaped areas, and around perimeters of structures. RATE: 1 – 2 lbs per 1,000 sq.ft. Despite shipping process being a little slow, this product performs very well and as I expected. Used this around the foundation of my house to keep bugs away from the house and any bug that I sprinkled this on to disturbed them and essentially killed the bugs listed and is helping repel any further bugs. Some were pill bugs, fleas, black/sugar ants, chinch bug, cockroaches, and maybe others that could occur down the line that i dont see right now.